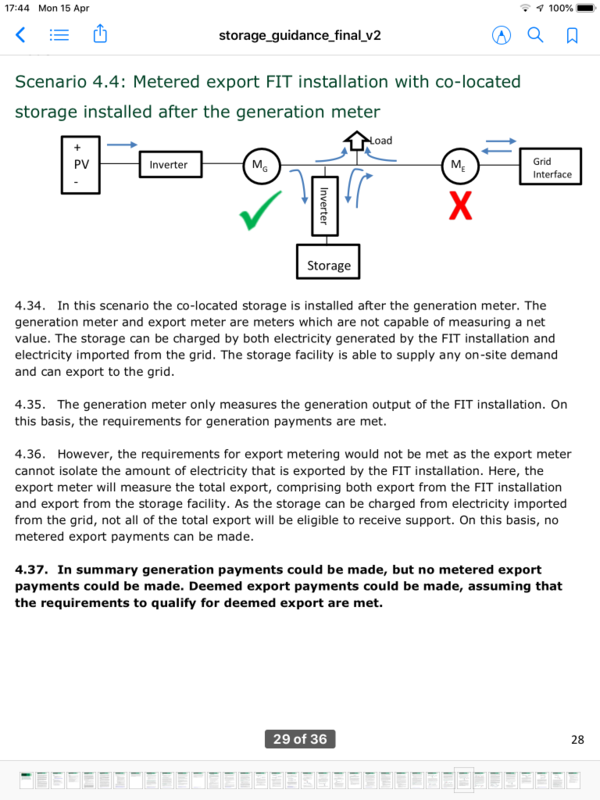 A recent discussion centred on whether, as someone in receipt of UK feed-in tariff (FiT) and having a smart meter, I should be on metered export or deemed export. I had previously been advised that my smart meter did not have an export register, but playing with the buttons revealed an active export register. The illustration above taken from OFGEM’s Guidance for generators: Co-location of electricity storage facilities with renewable generation supported under the Renewables Obligation or Feed-in Tariff schemes (Version 2) shows a configuration like mine, but rules out metered export since I can charge my battery from the grid and then export that power back to the grid. FiT terms are that only generated renewable power can be exported for FiT payment and thus, regardless of the capability of my meter, I’m only permitted to deem export. Deemed export does not incentivise purchase of power from the grid and then export. There could be an opportunity to use the export meter as part of an export tariff instead of the FiT export component, which wouldn’t have a restriction on buying and exporting grid power, but my high levels of self-use make this unattractive compared to deemed export at 50% of generation. 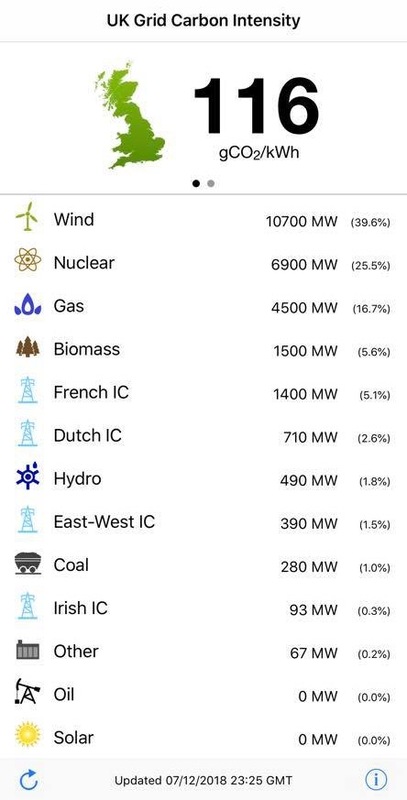 This entry was posted in Electricity storage, Energy, Smart meter and tariffs on 15/04/2019 by Greening Me. Here we have the whole assembly mounted on the side wall of the airing cupboard above the hot water cylinder. The whole assembly is mounted on a board which can be lifted off two screwheads. The cables are sufficiently long to allow the whole assembly to be placed on the floor should update be required. Below the assembly can be seen a socket outlet which provides power for the low current controls only. 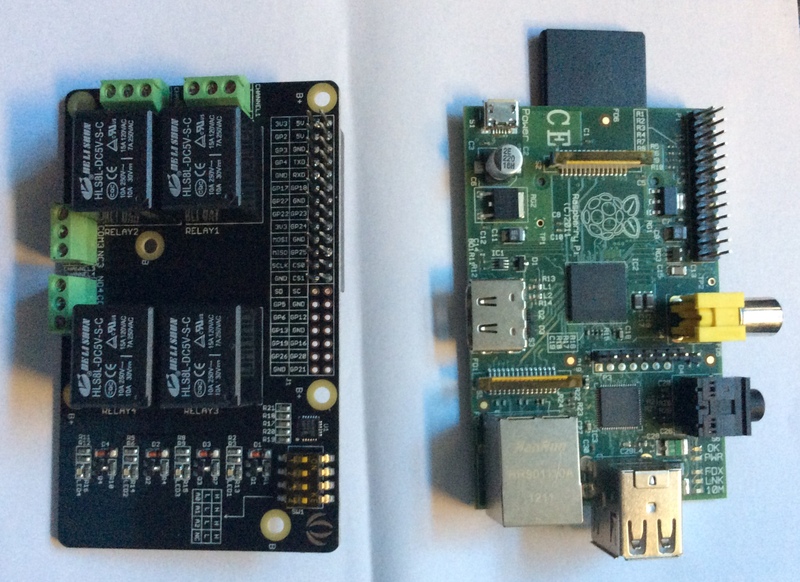 The Raspberry Pi that provides the HEMS functionality is powered by a re-used USB mobile phone charger. All this control side can be isolated by the simple expedient of pulling out the plug. The high current power for the immersion heater is hardwired via the ImmerSUN. All power is provided via the fused spur with single pole switch that originally powered the immersion heater alone. Use of multistand flex for wiring rather than solid twin-and-earth. Use of bootlace ferrules to terminate the ends of the cables before insertion into the screw connectors. Use of cable ties to secure the flex to the chassis of the ImmerSUN on the provided locations adjacent to the cable entry. 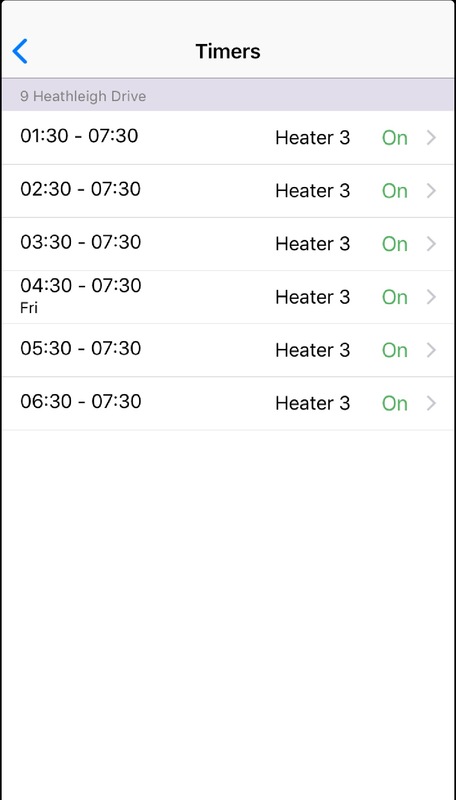 This entry was posted in Smart meter and tariffs on 01/01/2019 by Greening Me. The illustration shows the components mounted on a board before installation on the side wall of the airing cupboard. To the top left is the HEMS itself (less cover) with 4 black output relays visible on the HAT of which two are connected via the white cables to operate car charger and immersion heater. Immersion heater software isn’t written yet but will mirror the charger software but on a second channel. Not illustrated is the power cable to the HEMS – a standard mobile telephone charger and USB cable. To the top right is a 10-way junction box typically used for boiler installations. It takes switched inputs from the HEMS (x2) and ImmerSUN and uses them to drive the two outputs (radio transmitter and ImmerSUN Boost). To the middle right is the existing radio transmitter used to operate the car charger. In this new installation it can be enabled either by the HEMS when the bought electricity price is low or by the ImmerSUN when our solar panels are in surplus. To the bottom is the ImmerSUN. In additiona to power in and power out to the immersion heater, there are also two control signals: (i) a relay contact that closes when solar is in surplus to drive the car charger and (ii) a relay input that can be configured as ‘Boost’ enabling full power to the immersion heater on an external signal (in my case from the HEMS). This entry was posted in Smart meter and tariffs on 29/12/2018 by Greening Me. My holiday project is to create a Home Energy Management System (HEMS) able to optimise the costs to charge my electric car. 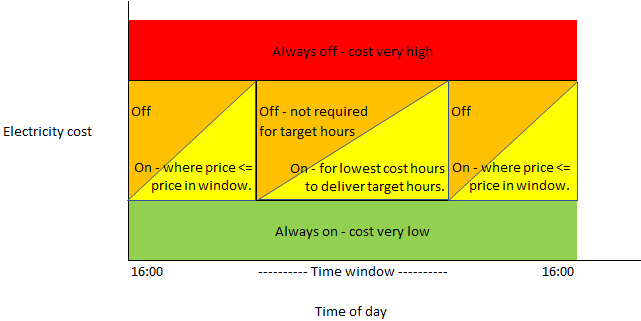 I currently have a smart energy tariff where the electricity costs can vary each half hour and day-to-day as a function of market price variations, The role of the HEMS is to select the cheapest time to charge the car. It will potentially control other loads in future, although car charging is my priority. 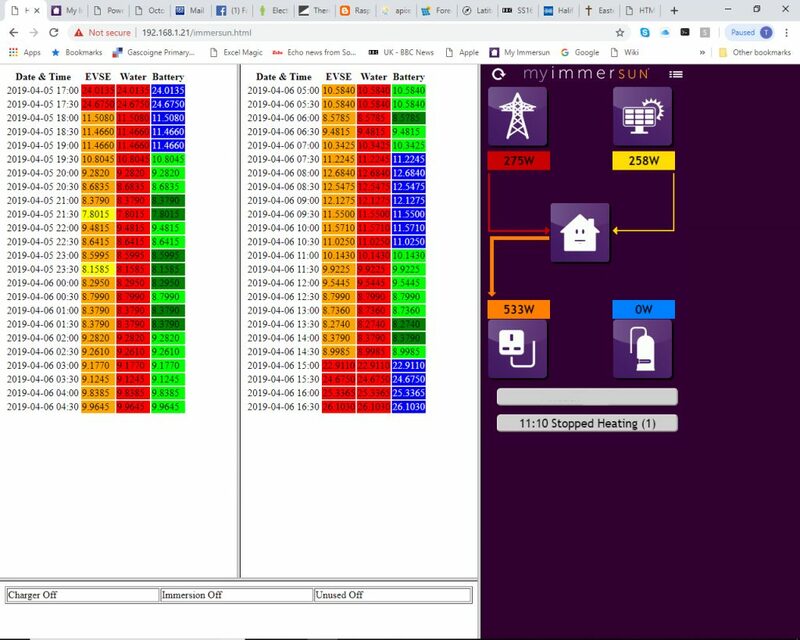 The HEMs is creating using a small computer called a raspberry pi which can read the electricity prices from my supplier when they are updated each day. Software of my own creation then decides when to turn a relay on or off to enable/disable the car charger, A configuration file can be edited to influence its behaviour. A charging schedule is built once daily and then a seperate process actions the schedule every half hour. An existing radio link, which is already used to automatically enable my charger when the solar panels are in surplus, will signal that the charger should be enable or disabled. I now have the HEMS running on my desk, although it’s not yet mounted in a case or wired to the transmitter. I have also created a small webpage to show the status. The webpage shows the 48 half-hour blocks between 5:00 PM one day and 5:00 PM on the next day. Each block shows the time, electricity price per kWh, and the resulting car charger schedule. It should be noted that there’s often much more variation in price through the day than is illustrated here. Indeed sometimes the price can go negative. The green block indicates a period where the price is below a floor price. The car charger is activated any time that the price drops below the floor price. The orange blocks indicated when the charger could be enabled if more hours of charging were required than the 3 hours currently specified by the user. Finally, the red blocks indicate where the price exceeds a user-defined ceiling price at which charging will not occur. My next steps are to do a little more testing on the bench while I await delivery of the case, install the system into the case, and then install it in the airing cupboard. In the longer term, my chosen hardware can switch up to four mains electrical loads. I anticipate adding the immersion heater so that hot water can be made when the electricity price falls sufficiently to make that attractive versus solar or gas. I could also enable some underfloor electric heating, but the costs to transmit a suitable control signal across the house would not be recovered by the small energy saving. This entry was posted in Smart meter and tariffs on 21/12/2018 by Greening Me. Last night was the first time that I experienced being paid to use electricity since we finally changed to the smart tariff a week ago. 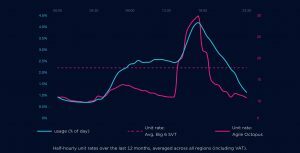 As a result of unusually high winds in some parts of the country there was an abnormal amount of electricity on the grid from wind turbines, causing the wholesale price to drop. Indeed the wholesale price dropped so low as to be negative. My own electricity cost is linked to the wholesale cost, so my costs dropped very low and indeed negative at times. 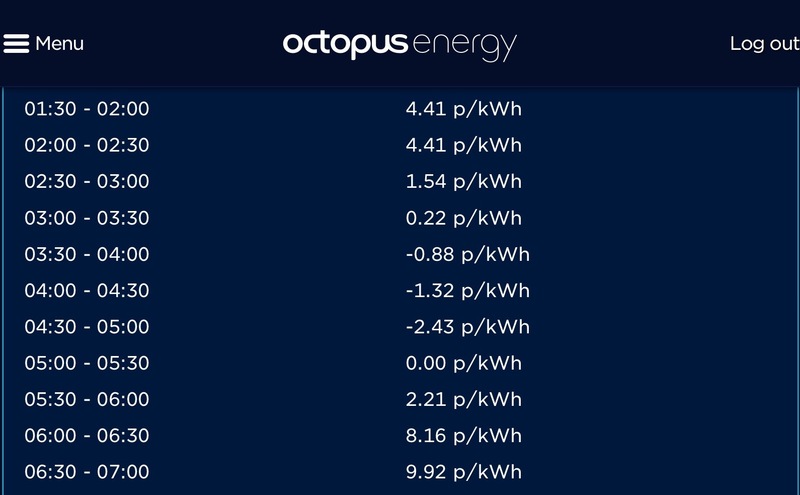 In those circumstances I remotely configured my car charging, battery storage and (for the first time) immersion heater to use the overnight power; and used the delay timers on the washing machine and dishwasher to start them during the negative cost period as their most intensive energy use is their initial water heating periods. This snapshot shows the instantaneous consumption part way through that period with relatively high house loads and water heating. 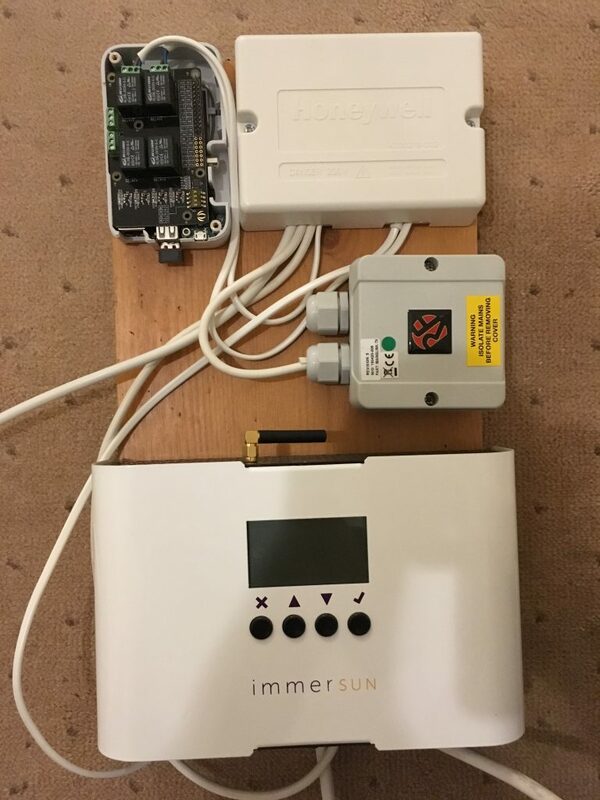 My holiday project – building a Home Energy Management System (HEMS) – should automate the operation of the car charger and immersion heater around the periods where energy costs are lowest. 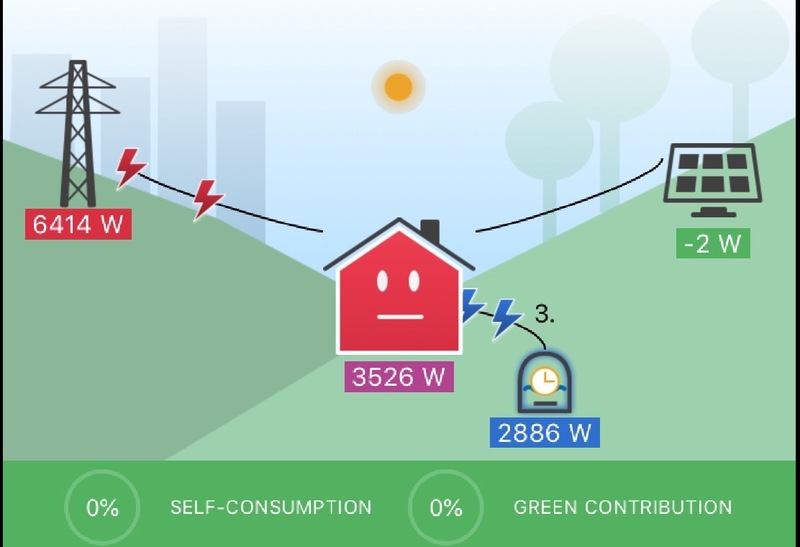 This entry was posted in Smart meter and tariffs on 08/12/2018 by Greening Me. Today I’ve been thinking about configuring the Powevault storage system around my smart electricity tariff in which costs can vary every half hour. Force charge – the battery storage charges at its maximum power (only 800 Watts) for 3.5 hours while electricity is cheapest. Charge only – a period while electricity is not quite so cheap when the battery will charge proportionally to any solar surplus, but will not discharge. It wouldn’t make sense to start discharging the battery when electricity is only marginally more expensive than when the battery was charged. This also prevents the battery discharging into my electric car if the car charges for a longer period than the battery. Normal – storage system will either charge proportionally to solar surplus, or discharge to minimise input. Force charge – as previously charges at maximum power in this case to ensure that some power is stored prior to the most expensive period. Normal – as previously but intended to cover the peak rate 4:00 to 7:00 PM period and beyond if there’s still stored energy. 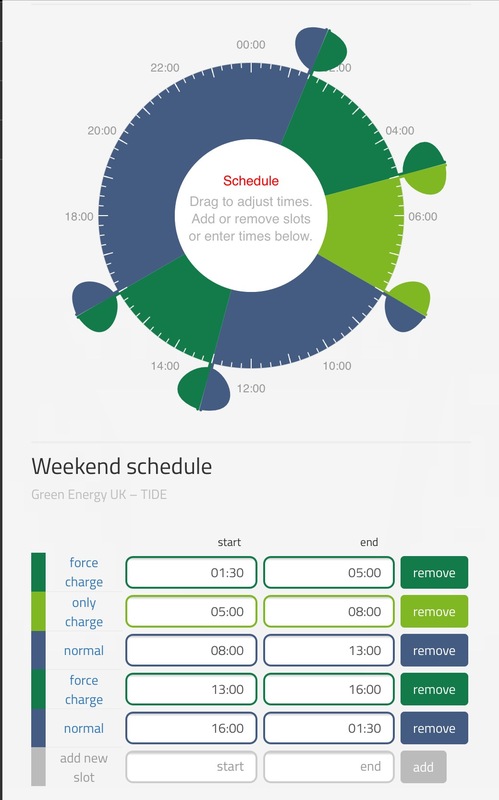 Now that this pattern has been created, it can be adjusted by dragging the tabs around clock to adjust for when the cheapest power is at a different time day-to-day. In the longer term I hope to automate such adjustment, although my priority is getting the car charger to automatically operate when power is cheapest. This entry was posted in Electricity storage, Smart meter and tariffs on 24/11/2018 by Greening Me. My current energy management arrangements are designed to maximise use of the output of my solar panels for lowest energy cost by diverting any excess to PowerVault storage system, car charger or immersion heater. 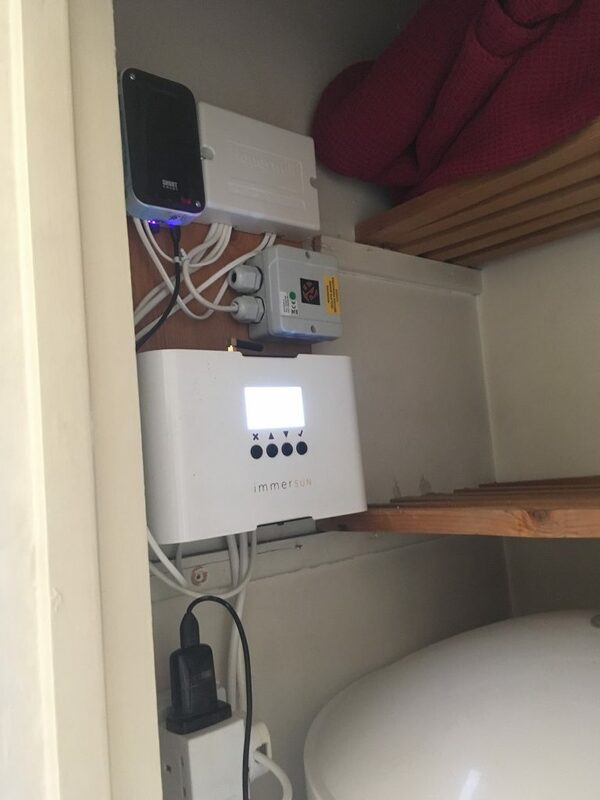 I can also manually configure the PowerVault and ImmerSUN to minimise costs of bought energy from the grid (I get 7 hours of cheaper night time electricity) by setting time periods for charging. 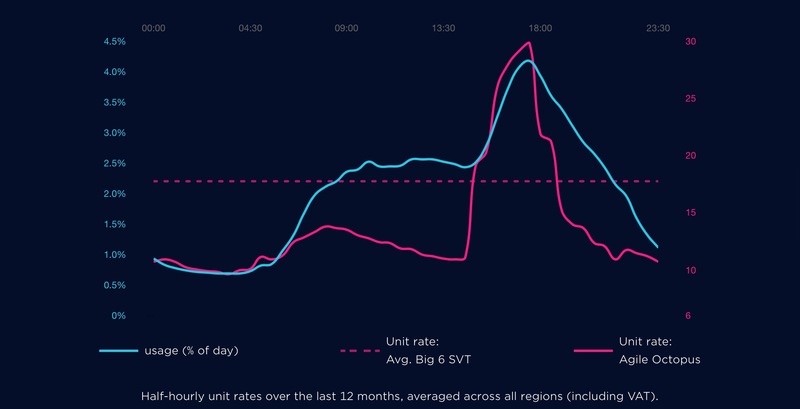 However as I move to a smart meter and smart tariff then I’m looking to start automating the selection of when to draw power from the grid based on costs that change half-hour-to-half-hour and day-to-day. The hardware to achieve this is illustrated here. 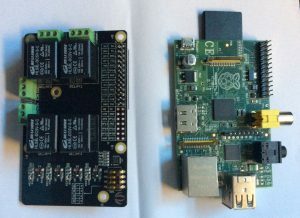 To the right is a Raspberry Pi – a small computer with a wide range of connectivity – and to the left is a module that sets on top and has four relays able to switch mains loads, although at the moment I only anticipate needing 2 of them. One of the relays will switch the boost input to the ImmerSUN to enable water heating, potentially when electricity is cheaper than gas, and a second relay will operate the transmitter that turns the car charger on alongside the ImmerSUN’s relay output during the cheapest available energy times. The image to the right shows the timers that can be used to enable the ImmerSUN outputs to draw power from the grid. I never use this for water heating as currently gas is always cheaper than bought electricity, but do use it to more or less effect seasonally to charge the car from cheap night rate power when there isn’t enough daytime solar. For the new HEMS I plan a table of 7 days specifying the number of hours required for each output and let the HEMS find the cheapest half hours to deliver the total hours required and enable the charger or water heating as required. This entry was posted in Charger control project, Energy Smart, Smart meter and tariffs, Water heating on 03/11/2018 by Greening Me.